Contacting of the metalized Piezoelectric ceramic Materials can be made using conductive adhesives, conductive rubbers, spring contacts or via soldering. Warm Tips:We can customize various piezoelectric ceramics as required. ShenZhen Apple Vista Tochnology Limited is a group company which has 3 factories under control, with all factories located in the most renowned city in China. Our main products include zirconia ceramic wire drawing capstans,tungsten carbide coating capstan pulley,High-tech ceramic structure,piezoelectric ceramics for humidifier and facial massage. 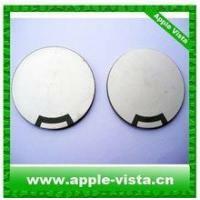 Apple Vista Limited has strong development ability for new products. We have own designers and tooling making factory as a strong back-up for several factories under control. We are absolutely qualified for OEM or ODM orders from our customers.Our various products make one-stop source easier for customers to mix different items into one container, which will make customers save purchasing cost.It's also very easy for customers to arrange payment to make inspection. Apple Vista Limited has strong R&D team, which always keeps us stand at the most fashionable trend in this field, hence it will benefit customers to compete in their own markets. All all procedures are strictly complied with international standards and rules.